Now, first off, what you need to know: Surgery is Not a cure. Surgery should be avoided because it is both ineffective and high risk. The best results for surgery state that only 6-14% men who undergo the procedure will attain a benefit [1, 2]. As a matter of fact, surgery may not be effective at all [3, 4, 5, 6, 7, 8], and can be detrimental in some cases. Only 6-14% of those who undergo surgery attain a benefit. Unfortunately, the answer is no. There is no complete cure for varicocele at this time.​ But, with my treatments, you can treat varicocele to a point where you no longer consider it a problem. My natural treatments are likely the most effective varicocele treatment option that exists at this time. Are natural treatments effective for varicocele treatment? The answer is absolutely, yes. The majority of my clients have reported complete cure of varicocele pain, great improvements in fertility, varicocele no longer progressing, and a 30-50% reduction in varicocele swelling (note: only a few of my clients have noted a complete cure)* (read the reviews!). Again, can my natural treatments help you? Well, I'm getting emails almost every single day of clients telling me about successful pregnancies, how quickly they attained pain relief, how glad they are to have avoided surgery, or how they are starting to notice great results. That's really the most important thing--that my treatments work. My goal is to help you treat varicocele effectively and with minimal effort, to the point where you no longer consider it a problem. I want to help you get past varicocele and to what's really important in your life (health, wealth, and family). Learn how to your varicocele without surgery! Follow these steps and you really will be able to avoid surgery. Look, there are many controllable risk factors for varicocele-- I call these lifestyle changes. Making these specific lifestyle changes simply makes a big difference in both your varicocele swelling size and symptoms. Best thing is: These take almost zero extra time out of your day, are risk-free, and have added health benefits. ​Now, varicocele occurs due to impaired circulation. When blood doesn't circulate well, it pools. Pooled blood is toxic blood. It damages the testicles, sperm, sperm DNA, veins, as well as vein valves! 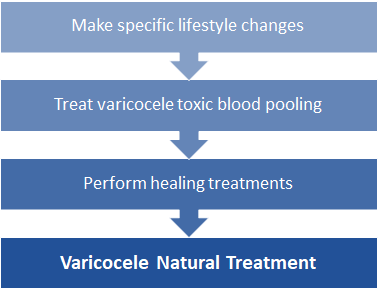 So, treating varicocele toxic blood pooling is an effective and important strategy curing varicocele pain, restoring fertility, and really allowing healing to occur. ​Now, many of us have a lot risk factors that are both unhealthy for our testicles and veins. The goal is to do less damage and a better job at healing. Doing so, improves the speed of varicocele recovery and really helps alleviate your symptoms.